Yes, we know... you suddenly become an event planner, calendar wrangler, kiddies entertainer, time manager extraordinaire. You KNOW Luna Park is a no brainer for non stop kiddie fun (unlimited rides, anyone? YES! For kids AND adults) and now the iconic Sydney historical theme park is introducing the BIGGEST Shopkins and Grossery Gang attraction with an entire Shopkins and Grossery Gang Village! YES! Featuring a Shopkins Swapkins Station allowing children to swap their Shopkins with fellow fans (so, it's Shopkins aficionado heaven) and a Shopkins and Grossery Gang Museum and Treasure Hunt, there will be daily meet and greets with Kooky Cookie throughout Luna Park, and much more. Featuring every Shopkins and Grossery Gang character ever created, a selection of one of kind Shopkins showbags and merchandise and an exciting opportunity for guests to have their very own Shopkin design made into a real life Shopkin by entering the Design your Own Shopkin competition, the Shopkins and Grossery Gang activities are bound to set little hearts racing and provide endless hours of entertainment these school holidays. In addition to Luna Park Sydney’s traditional rides, including the recently reinstated Tango Train with a modern twist, LED light show and state of the art technology for a faster white knuckle ride, a brand new experience will be making its debut at the park only for the holiday period – The Avenger. For the older and braver crowd, the ride spins on three axes. Think extreme adrenaline and extreme fun for those brave enough to strap in. As the weather warms up, Luna Park will not only be THE perfect Sydney day out for young and older folks (the ferries wheel! Coney Island! The dodgem cars! The Hair Raiser drop tower! That million dollar view! ), you should stay tuned for the fun pop up exhibits like this, themed events like Halloween (Halloscream), and much more. For all your questions on Luna Park, click HERE. 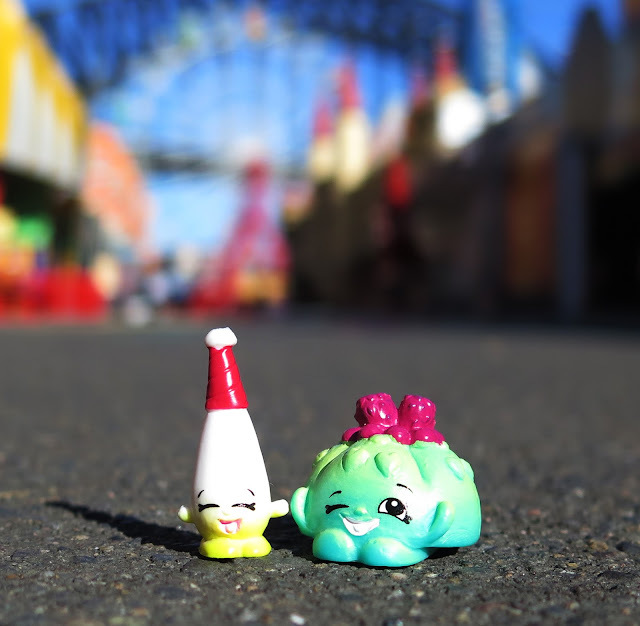 For more on Shopkins at Luna Park, click HERE. You can explore the Shopkins and Grossery Gang Village, open daily during the school holidays from 10am - 4pm. Note: ENTRY IS INCLUDED WITH YOUR UNLIMITED RIDES OR ANNUAL PASS WRISTBAND. The Shopkins and Grossery Gang Village is open daily until 10 October. And: it's exclusive to Luna Park Sydney. Follow Luna Park on Instagram HERE. Follow Luna Park on Facebook HERE.